Objective: Transjugular intrahepatic portacaval shunt (TIPS) is a traditional and effective treatment for variceal bleeding in cirrhotic patients with portal hypertension. However, in patients with a Budd-Chiari syndrome or other unaccessible hepatic veins, a direct puncture through the inferior caval vein may be inevitable. Direct intrahepatic portacaval shunt (DIPS) also has several advantages compared with TIPS. So we are expected to explore a digitalized model of DIPS and find the suitable shunt pathway of DIPS. Materials and Methods: We chose four hundred serial sectional images from the internal jugular vein superior margin to the edge interior hepatic from Chinese Visible Human Dataset. Surface and volume reconstruction were performed by 3D Doctor 3.5 software programs(ABLE SOFTWARE). Results: We reconstructed a digitalized model including liver and relevant vessels. It can display distribution characteristics and spatial structure relationship of intrahepatic vessels from any positions and angles. Conclusion: DIPS represents a useful addition to the endovascular techniques for managing complications of portal hypertension. The model of DIPS provides a good 3D morphological reference of image diagnostics and interventional therapy for DIPS. Objective: Smartphones have evolved from luxury to essential need items in general population nowadays. iOS by Apple, Android by Google, Windows by Microsoft and Blackberry account for the majority of smartphone operating system which are currently in use today. Materials and Methods: The present study was done among 350 students of medical, dental, nursing and physiotherapy streams to know the prevalence of smartphone use and attitude towards its use. Of the 350 students enrolled in the study, 257 completed the questionnaire with a response rate of 73.4%. Results: Out of 222, 198 had android devices, 13 had iPhones, and 11 had other operating systems including Windows and Blackberry. 191 (74.3%) of the subjects had a working email account. Conclusion: First year students have positive perception towards smartphone use and medical schools should encourage the use of medical applications among them. However, students and medical professionals should be cautious of the negative issues with smartphone use. Objective: To evaluate, the feasibility and efficacy of three-dimensional (3D) digital navigation, 3D design, and 3D printing in the surgical treatment of giant tumors in thoracic cavity. Patients and Methods: A 62-year-old male patient had a giant tumor in the left thoracic cavity. The tumor constricted the left lobe with the left chest wall being involved. We performed high-precision consecutive thin-sectional computed tomography (CT) scanning and obtained the 3D model of the tumor, lung, pulmonary, tracheobronchial tree, sternum, ribs, and costal cartilage with self-developed 3D image processing software. Before surgery, we also carried out digital navigation, printed out the tumor and the chest wall that is intended to be reconstructed, and developed the surgery program for the giant tumor. At the same time, 3D chest wall titanium was produced based on 3D printing. We performed giant tumor resection and sutured the titanium plate to the chest wall of the patient to repair the chest wall defect. After surgery, we performed CT scans and 3D reconstruction in order to determine the efficacy of surgical treatment. Results: The results showed that we successfully designed the repair surgery program for chest wall defect after the tumor resection. 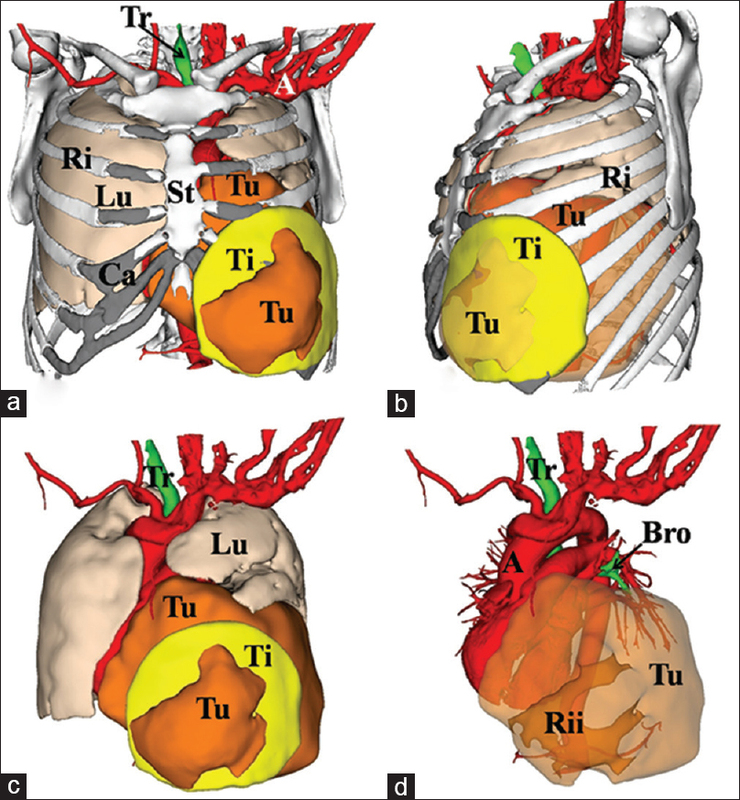 Titanium based on the 3D printing-assisted design completely fit the chest wall defect. Blood loss was significantly reduced compared to conventional titanium suture. There were fewer postoperative complications, and patient recovery was fast. Conclusion: We conclude that 3D printing-assisted resection of tumors in the thoracic cavity and chest wall reconstruction contributes to developing surgery program and performing complex thoracic surgery, which improves the efficacy of surgery, shortens the operation time, reduces the abrasion of conventional steel implant to the residual sternum, ribs, chest wall muscle and pleura, decreases the bleeding, abnormal breathing, and achieves the developmental shift to digital and personalized cardiothoracic surgery. Objective: To fully understand the original spatial position and three-dimensional (3D) anatomical morphology of cardiac skeleton (CS), and to quickly locate its position in patient-specific computed tomography angiography (CTA) images. 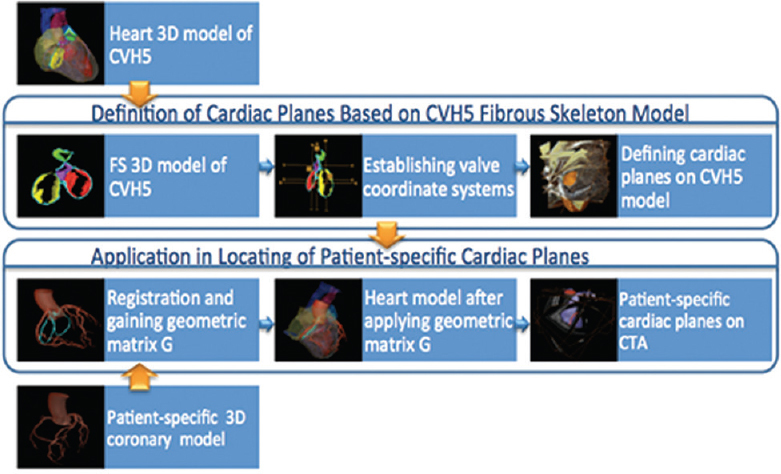 Materials and Methods: First, we segmented and reconstructed 3D models of CS and its attached valves with Amira software, defined valve planes based on Chinese visible human 5 (CVH5), and then computed its geometric transformation matrix and applied them in locating the valve planes in patient-specific CTA images. Results: We reconstructed a 3D CS model based on CVH5 images which keep the original spatial position and its normal anatomical appearance. The 3D structures include aortic valve annulus (AVA), mitral valve annulus, tricuspid valve annulus, pulmonary valve annulus, and its attached valves. With the relative geometric transformation matrix, we quickly located the patient-specific valve planes that are vertical to each valve in CTA images. Conclusions: CVH5 dataset can be used in reconstructing the 3D model of CS, which is difficult for clinical images, such as CT, magnetic resonance imaging, and traditional anatomical method to achieve. Our method of 3D reconstruction presents more anatomical details than clinical images and keeps the original shape and position. We can define each valve plane on the CVH5 model and show its corresponding plane in patient-specific CTA images, which can be observed on each valve plane at the same time based on the consistent reference. Objectives: This single-center prospective, case-controlled study investigated satisfaction and esthetic results as rated by the physician and patient, respectively, by following up thirty patients with aging face, who underwent facial autologous fat grafting with platelet-rich plasma (PRP). 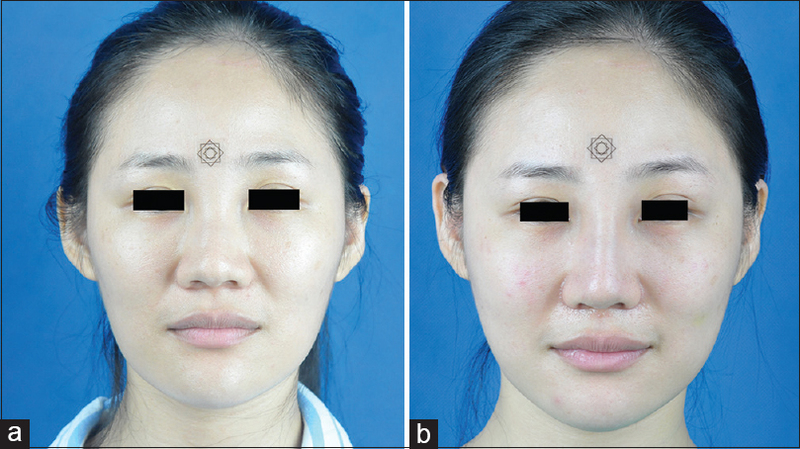 Materials and Methods: A retrospective review of thirty patients, who were suffering from facial sagging or partial depression and requiring autologous fat grafting between February 2012 and September 2015. Photograph was taken before and 3-month after the operation. Patient and physician satisfaction was rated using visual analog scale (VAS) ranging from 1 (least satisfied) to 10 (most satisfied) 3 months after the operation. Statistical difference between the patient and physician satisfaction scores was analyzed by SPSS 17.0 software. Results: The patients' average age was 34.5 ± 1.2 years. The average VAS score of physician satisfaction was 7.9 ± 1.0, and the average VAS score of patient satisfaction was 8.0 ± 1.2. There was no statistically significant difference between the two groups in scores (P = 0.859; P > 0.05). Conclusion: There is no evidence that different donor sites or different donor-site preparation will lead to different outcomes. Multilevel injection is recommended for autologous fat injection. The high satisfaction scores indicated a good esthetic result of facial autologous fat grafting with PRP. Autologous fat as one of the popular soft tissue fillers is durable and safe. The biggest challenge is the high variation in absorption rate. PRP may lead to higher survival rate of fat and satisfaction level. The stability of survival rate of autologous fat grafting with PRP and the connection between complications and PRP technique need further study. 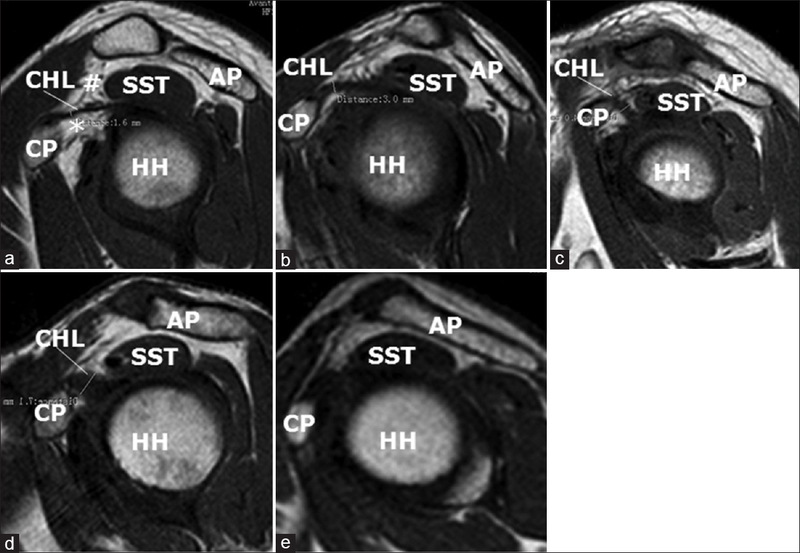 Objective: The purpose of this study was to analyze how fat distribution in the rotator cuff interval (RCI) in normal volunteer shoulders determines the coracohumeral ligament (CHL) visualization, including the CHL visualization rate, type, and thickness, using routine magnetic resonance imaging (MRI). Materials and Methods: This study prospectively analyzed 120 shoulder joints in 60 normal volunteer individuals (30 males and 30 females) using MRI to identify the fat distribution type in the RCI as well as the CHL visualization rate, type, and thickness. Results: The fat in the RCI was visualized in 110 of 120 shoulders (91.7%) while the fat in the RCI was not identifiable in 8.3% of normal volunteer shoulders. The fat distribution in the RCI was classified into five types: Type A (52.5%), Type B (26.7%), Type C (5.8%), Type D (6.7%), and Type E (8.3%). The CHL types included the horizontal type (73.3%), upsloping type (12.5%), downsloping type (5.9%), and unseen type (8.3%) (The CHL was not identifiable in 8.3% of normal volunteer shoulders). No significant difference existed for the fat distribution types in the RCI or the CHL visualization rate, types, or thickness in either different lateral shoulders or different gender shoulders, using a Chi-square test (P > 0.05). In addition, no significant correlation emerged between body mass index (23.4 ± 2.5, n = 110) and the CHL thickness (3.1 ± 1.3 mm) in normal volunteer shoulders, using the Pearson correlation test (n = 110) (r = −0.095, P> 0.05). Conclusion: MRI is a satisfactory method for determining the fat distribution in the RCI and CHL depiction in normal volunteer shoulders. The fat distribution in the RCI determines the CHL visualization, including the CHL visualization rate, type, and thickness.